Recently an online discussion has been taking place on the subject of the numerical imbalance of people of color in our national parks. This is an issue that has been on my mind for several years, but so far, I have not begun to understand why so few black and Hispanic folks visit Yellowstone. I wrote a comment on the “High Country News” online post by James Mills, who studied the question in some southwestern national parks this summer. When I saw the interview with the very articulate and obviously dedicated black Yosemite ranger, Shelton Johnson, on the Ken Burns/Dayton Duncan TV series on the national parks in 2009, I thought this might help to draw people of color to the parks. According to Mills, Johnson wrote a letter after that series was aired that encouraged Oprah to go on her well-publicized camping trip to Yosemite. In May 2010 I attended an independent publishers meeting, where I brought up the subject with two black women publishers I met at an informal gathering. I asked them what I could do or what could be done in general to encourage people to try the outdoor experience. Their suggestion was to get a famous black musician or athlete to set an example and publicize his or her trip in media that is popular with black people. We probably need to see many more trips like Oprah’s by many prominent and influential people of color over a period of time to begin to make a difference. One person who commented about Mills’s post remarked that many people don’t like to camp. I can attest that, at least in Yellowstone, it is not necessary to camp to enjoy the park; there are cabins and hotels ranging in price from $30 to $235 a night—I stayed in the whole gamut of them this summer. 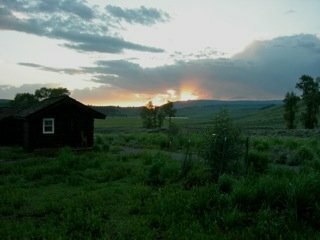 At the top of this post is an early July sunset from our cabin at Lamar Buffalo Ranch ($30 per person per night). I saw more black people in Yellowstone this summer than in former years—but not very many more. Mills mentions a program in the Tetons called the National Park Service Academy that “invites college students to visit the park on spring break, and thereby be exposed to many of the careers open to them in the National Park Service.” Much more of this sort of thing is needed. Perhaps city people just don’t know what it can do for them to spend some time in nature. All Americans, as well as people from other countries who are able to travel, should feel welcome in our national parks and should be given the opportunity to appreciate what the parks have to offer us. Programs like the NPS Academy that Mills tells us about are surely a good idea. I can’t say how we should solve it, but discussing this problem is a step in the right direction. More “debriefing” about what I saw and thought about on this summer’s Yellowstone trip will follow here soon.